RUSH is set-up and is ready to continue to win races now! 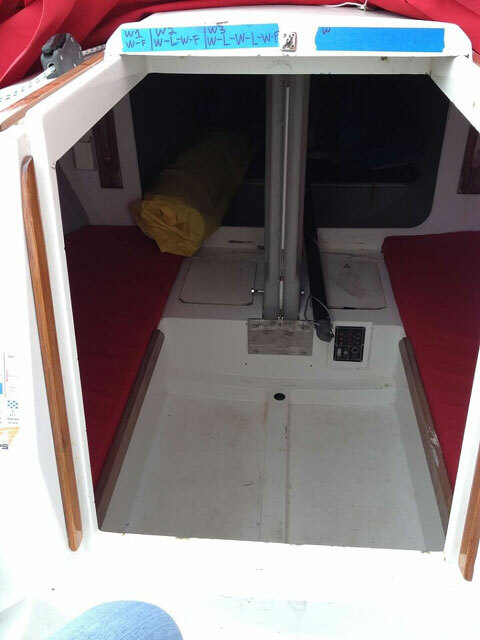 This is truly a "turnkey" boat with numerous upgrades since late 2013. 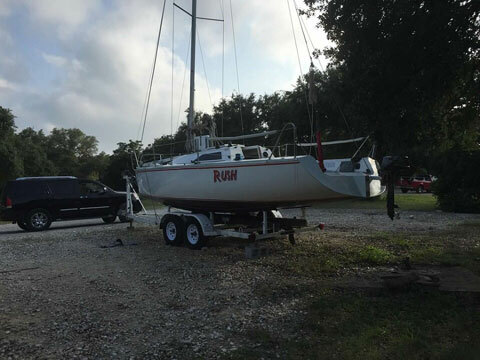 Boat is solid and is in good condition for its age but does have some cosmetics marks, dings and some repairs over the years which is pretty standard for a race boat. Besides being a fantastic sailing and racing boat, the Tripp 26 is very versatile for easy travelling and ramp "motorboat" launching. 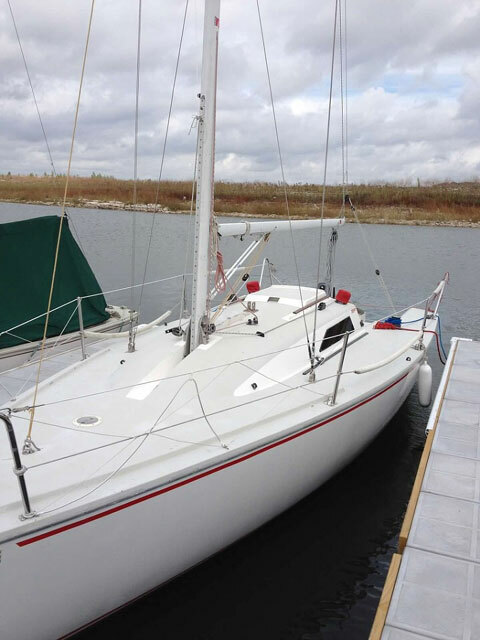 Dagger board retracts from a draft of 6' to 18" with the help of a interior mounted 12V keel winch that can raise the keel in less than a minute. The mast is on a tabernacle and the boat comes with a custom aluminum gin pole (2017) that attaches to the spinnaker ring. 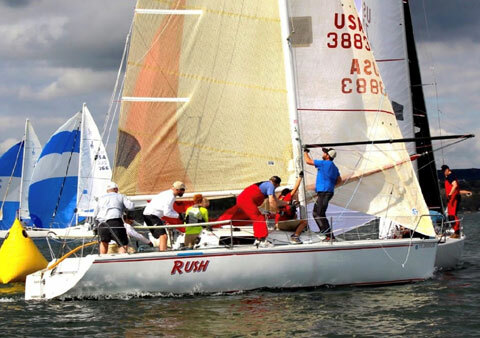 RUSH has a custom Sunbrella partial deck cover that covers the vast majority of the deck and cockpit along with mainsheet to the boom. Sunbrella mast cover at halyard exits to protect halyards. 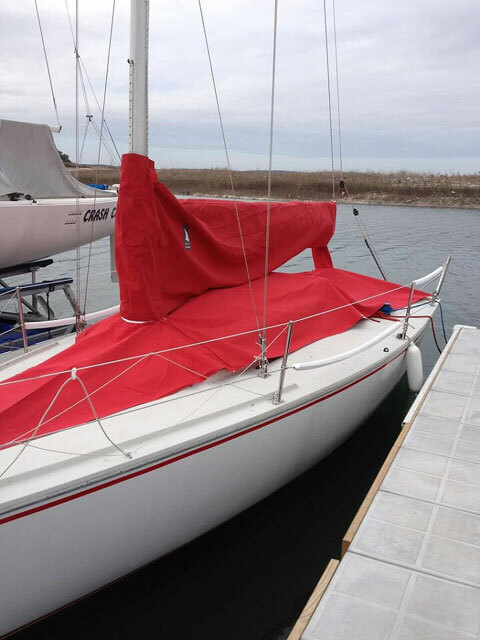 Sunbrella custom mainsail, tiller and primary backstay purchase covers too. Halyards and topping lift �skyed� to protect them from UV damage. 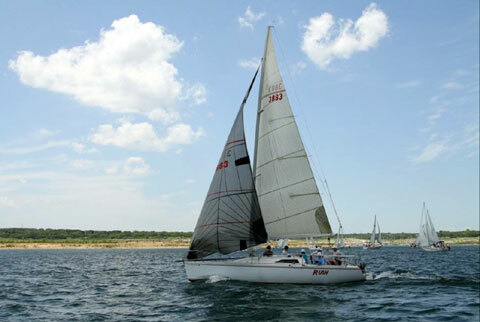 The Tripp 26 was designed to run either a symmetrical or asymmetric spinnaker pole set-up. For the asymmetrical set-up, the carbon fiber spinnaker pole is oversized at 13' (class legal) and is designed to sit at deck level still attached at the lowest spinnaker pole setting thanks to the design of the front of the cabin house and u-shaped bow pulpit. RUSH is currently set-up in the traditional symmetrical spinnaker set-up as she loves to sail deep directly to the leeward mark! Halyards all replaced in the last few years : NER V100 Vectran main halyard , NER Endura Braid Dyneema spin halyard, NER T-900 Technora/Dyneema genoa halyard and NER VPC Hybrid spin topping lift. Optional runners: Samson Spec 12 with tail covers. Runners are optional for increased upwind head stay tension. 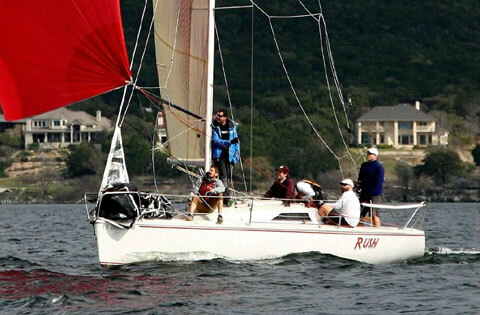 RUSH is a fantastic boat to say the least but I have decided to move forward in another class. Owners personal items not included.